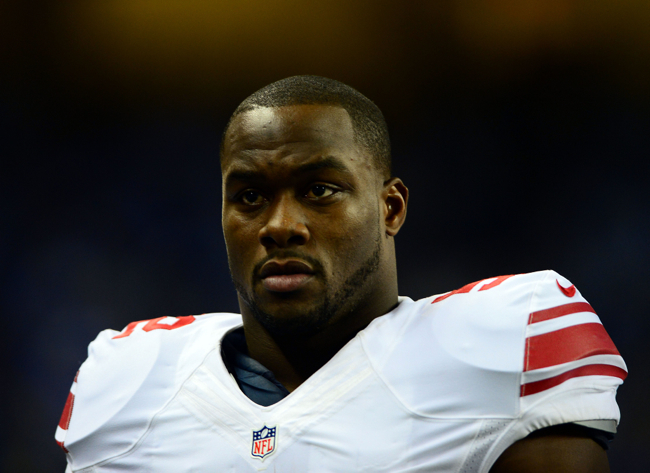 New York Giants middle linebacker Jon Beason said on SiriusXM Radio today that he and the Giants are currently in contact about a re-structured contract that would reduce Beason’s 2015 salary cap number. Beason is in the second year of a 3-year, $17 million contract that he signed with the Giants last offseason. He is currently scheduled to receive $3.6 million in base salary, a $2.2 million roster bonus, and a $100,00 workout bonus. Counting his prorated signing bonus, Beason’s total 2015 cap number is $6,691,666. Beason’s 2014 NFL season was basically wiped out due to a ligament tear and fracture to the sesamoid bone in his right foot during an OTA practice on June 12. He aggravated the injury in Week 2 against Arizona, missed the next three games, and aggravated the injury again in Week 7 against Dallas. After that, the doctors decided he needed season-ending surgery and Beason was placed on Injured Reserve in October. In the end, he only played and started in four games and finished the season with 11 tackles. If the Giants cut Beason before June 1st, the team would “save” $2,858,332 against the cap with a hefty $3,833,334 in dead money. “I want to be a Giant,” said Beason, who represents himself in contract negotitions. “They took a chance on me when other people may have thought that I was done. You want to go out and hold up your end of the bargain. When healthy I still feel I’m the best in the business and no one can keep up with me. “We’ve been back and forth trying to come to terms. They’re doing the best they can to try to be fair under the situation and as a so-called agent I’m doing the best I can to make sure I get the opportunity to earn some of that money back. What you hate is that you get penalized for what happened in 2014 when it’s no longer in anyone’s control. But if you do go out and you play well and you make the Pro Bowl, the guys win the Super Bowl, you make the playoffs, to take less money than what you were scheduled to earn is tough because you no longer have that opportunity to hit that benchmark. That’s the nature of the game. “I’ve had the benefit of doing my own contract and you see how the business works. Unfortunately when you are making more than the league minimum you are susceptible to taking a pay cut due to injury. A lot of that has to do with the leverage that the teams have. What I’ve learned is that you can’t take it personally when the team is going to come after you to get money back based on an injury because the other 31 teams seem like they’re on the same page. ‘Hey, we’ll low-ball you worse if you decide not to take the pay cut.’… It’s an unfortunate part of the business, but at the same time staying in the game and continuing to play is ultimately what you want. And they know that. Victor Cruz is hoping to run on flat ground by late April-early May and then begin cutting, running routes late May into June. New York Giants May Pursue Ndamukong Suh: According to press reports, the New York Giants may pursue unrestricted free agent defensive tackle Ndamukong Suh (Detroit Lions) when the free agency negotiating period begins on March 7. The New York Daily News is reporting that “several NFL sources believe the Giants are considering a run” at Suh, who is widely-regarded at the top unrestricted free agent on the market. 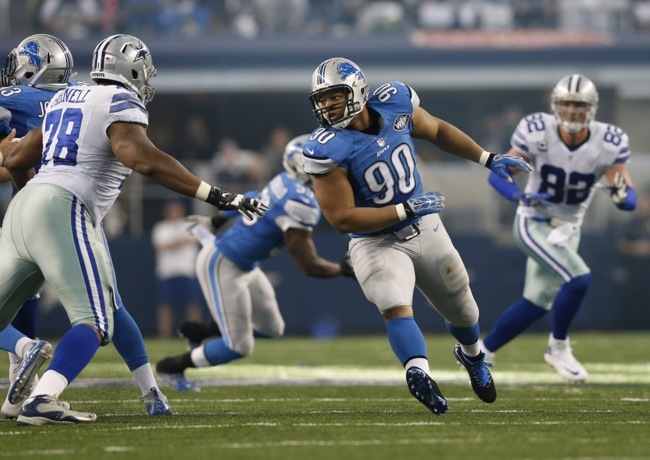 ESPN is also reporting that the Giants may be one of the teams in the mix for Suh. However, with the Giants only currently about $10-13 million under the $143 million cap, the team would have to be creative to find a way to pay for Suh. The Giants could extend/re-structure some contracts (including that of QB Eli Manning) or cut players or force them to take pay cuts. There is also the possibility that the Giants could remove the almost $15 million franchise tender on defensive end Jason Pierre-Paul. The 28-year old Suh is one of the best defensive linemen in the NFL and the rare defensive tackle who can both play the run and rush the passer. The problem for the Giants is that many teams with a lot more cap space are expected to bid on Suh, who may be seeking a contract in the 6-year, $100 million range with $50 million in guaranteed money. Victor Cruz Injury Update: On a Giants.com video interview, New York Giants wide receiver Victor Cruz said he expects to be ready to practice by the time training camp starts in late July. If Cruz is able to practice at camp, he would likely be limited as he is recovering from a very serious injury, tearing the patella tendon in his right knee in October 2014. 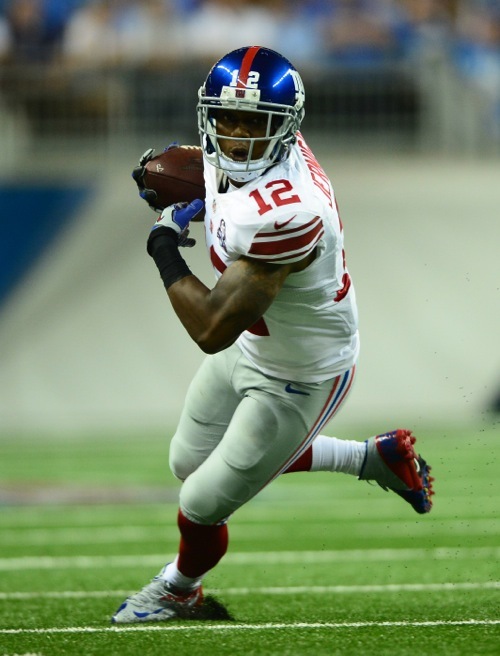 It remains to be seen if Cruz can completely regain his pre-injury physical ability. Giants.com Feature on Center Weston Richburg: A video feature “Building Blocks: OL Weston Richburg” is available at Giants.com.